Holcus lanatus.Joseph DiTomaso. Copyright © 2014 CC BY-NC 3.0. Bugwood – www.bugwood.org/ .New England Wild Flower Society.gobotany.newenglandwild.org (Accessed 5/2014). 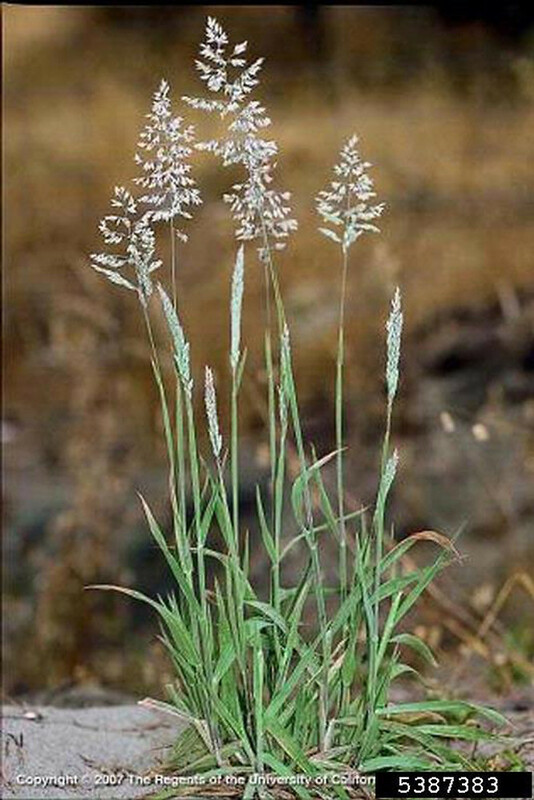 Holcus lanatus is a perennial, C3 grass (Waller and Lewis 1979), tufted, to 0.2-1 m tall; most parts velvety-hairy, pale grayish green. Leaves 0.4-1 cm wide. Usually hairy and gray-green (Gargiullo per. obs.). Flower spikelets gray-green to pinkish or purple, 0.3-0.6 cm long, crowded, hairy (Thompson and Turkington 1988) glumes hairy, hiding 2-flowered spikelet, lower floret fertile, upper staminate, with awned lemma; May-July; inflorescence a densely flowered panicle, contracted to open, sometimes pinkish in sun (Brown 1979). Habitat: Open areas, wet to moist, rich to poor soil, roadsides, lawn edges. Tolerates soil pH 4-7 (USDA, NRCS 2010). Notes: Killed by severe frost, but large numbers of seeds remain in seed bank. (The Nature Conservancy 1995).